Le Boat has opened its 2018 cruising season on the Rideau Canal near Ottawa. 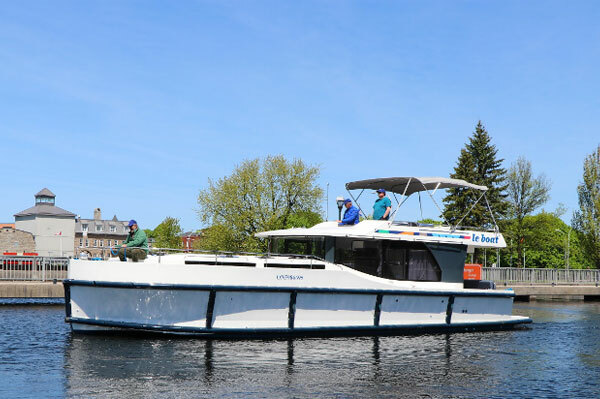 Le Boat is known as Europe’s largest boat rental company and this year expanded into North America with the launch of the company’s first North American destination and base operation in Smiths Falls, Ont. On May 18, Le Boat hosted a small ribbon cutting ceremony at the Kilmarnock Lock Station with three of their new Horizon Cruisers. Lisa McLean, national marketing manager for North America, and Amanda Breeze, sales agent, had the honour of cutting the ribbon at the official opening of the locks, allowing the cruisers to be one of the first to pass through a lock on the UNESCO World Heritage Site, The Rideau Canal. Le Boat has a fleet of 16 Horizon cruisers, especially designed to meet Ontario Maritime and Le Boat customer requirements. Bookings for this region began last year, and Le Boat recently announced that they are currently 72% sold out, but noted there is still some boats available for the 2018 season. “The Rideau Canal is a vacationer’s dream, offering the best of all of Le Boat’s European destinations in one place. It has the elegant beauty and charm of French waterways, the delightful lagoons of Italy, and the dramatic, scenic lakes and rivers of Ireland, Holland and Germany. Most of all, it is a mecca for lovers of nature, with every imaginable water sport such as fishing, paddle boating, canoeing, swimming, as well as hiking, biking and bird-watching,” said Cheryl Brown, managing director at Le Boat. No experience or boating license is required to rent with Le Boat. To facilitate the ease of handling for new and experienced boaters alike, the Le Boat Horizon is equipped with bow and stern thrusters for easy maneuvering into and out of locks. It has bumpers around the whole boat for safety and has a capped speed at 10 km an hour for the Rideau. Le Boat’s Premier Horizon cruisers offer large forward staterooms, a roomy top-deck area with BBQ, diverse amenities and a high level of comfort. There are four different models to choose from and they sleep from two up to 10 people.